Ultimate pecan chocolate chunk cookies have arrived. Move over regular cookies! Many apologies to my big brother, who has such a severe pecan allergy that an EpiPen is on his person at all times. (Except he usually just takes a swig of liquid Bendryl and goes back to his day, but that’s just how big brothers are, aren’t they?) But these cookies are insane, and if you love nuts in your cookies, you have to make these! These cookies, you guys. THESE COOKIES. After being freshly toasted, half of the pecans are ground up into a flour, while half are chopped for the dough. It’s what makes them ultimate pecan chocolate chunk cookies. It’s two hits of pecans, and you’re going to be totally okay with pecans hitting you. I should also mention that while we’re toasting the pecans in the oven, we’re going to toast coconut flakes on the same sheet. Is this cookie sounding legit yet? (I am only into legit cookies. See my Salty Vanilla Bean Espresso Chocolate Chip Cookies for reference, please). 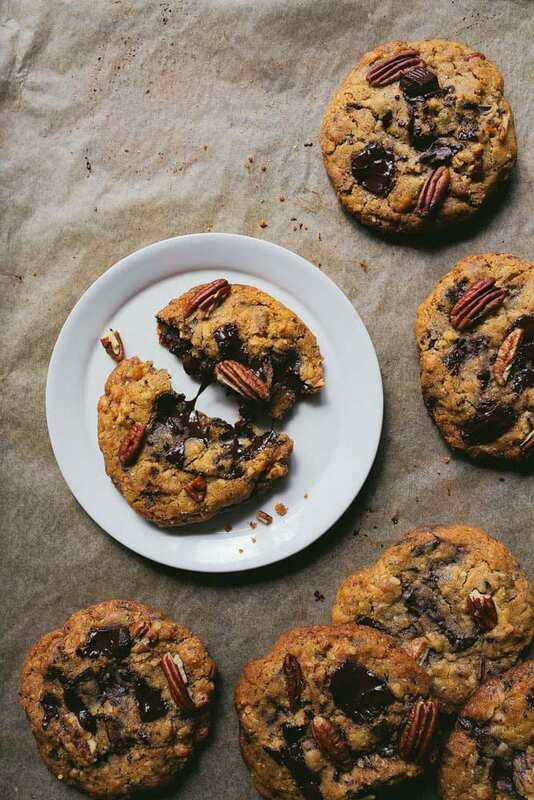 These ultimate pecan chocolate chunk cookies are from Naomi Robinson’s new cookbook Bakers Royale. Naomi’s book is inspiring, incredibly written, and so beautifully photographed that it makes me tear up. This is the book you pull out on weekend mornings when you want to bake something that not only tastes incredible, but looks incredible, too. Naomi is a baking goddess. She’s my idol. I had a difficult time choosing a recipe to make and share with you, because I wanted to make and eat every single thing in the book! (I’m making her Graham Dutch Apple Pie next!). I settled on this pecan chocolate chunk cookie when I read the instructions and saw that Naomi uses the freshly toasted pecans as flour and chunks in the cookie. When I sent Naomi some photos and played ‘guess what I’m baking,’ she immediately replied ‘You’re making the chocolate chip cookies!” And I had to laugh, because to Naomi, this is just her regular everyday chocolate chip cookie, but for me, it’s an extra special chocolate chip cookie, turned up a few notches. Naomi operates at a much higher frequency than the rest of us when it comes to desserts. I made a half-batch of her recipe (because I’m annoying like that), and after eating one cookie, I knew I had to get the rest out of my house. I was boxing up a package for my mother-in-law, and conveniently slipped in the cookies. There were no complaints upon arrival. 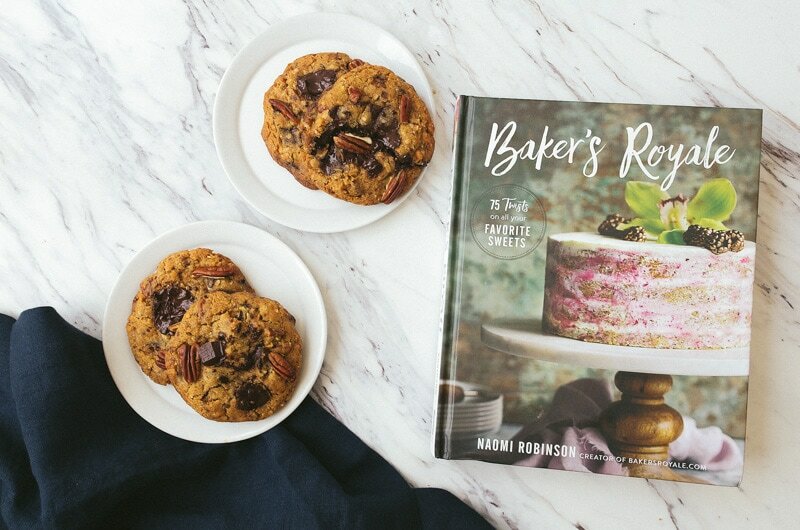 Grab a copy of Naomi’s book, and let’s bake from it this Fall together! 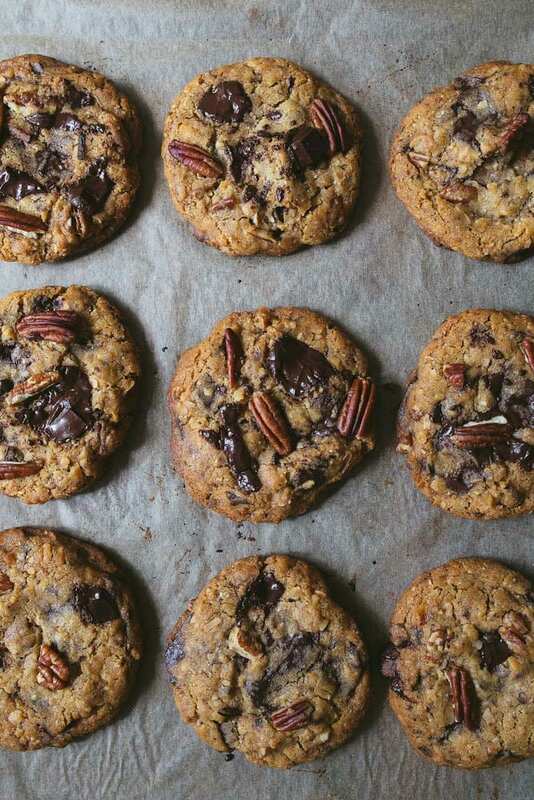 Ultimate Pecan Chocolate Chunk Cookies. Line a baking sheet with parchment paper or a silicone mat. Spread the coconut on the top half of the sheet, and the pecans on the bottom half of the sheet. Bake until lightly toasted, about 7-9 minutes. Remove from the oven and cool completely. Once cooled, portion out 1/4 cup + 2 tablespoons pecans (34 grams) into a food process, and pulse until crumbs form. Don't pulse too long or you'll make pecan butter (delicious, but not what we're going for). Roughly chop the remaining pecans (about 3/4 cup or 75 grams), and set aside. In a small bowl, sift together the flour, baking soda and salt. Whisk in the coconut and pecan flour. Set aside. Add the yolk and beat until fully combined, followed by the vanilla and molasses. Add the flour mixture all at once, and beat on low speed until the dough just barely comes together--you will see some flour streaks. Using a wooden spoon, stir in the chocolate chunks and chopped pecans until the dough comes together. You may absolutely bake the dough right away (as I did for the photos), but Naomi recommends a 3 hour rest in the fridge. Cookie dough intensifies with a rest, so I highly recommend it. I just skipped this step because I had to photograph the cookies while the sun was still up). When ready to bake, line a cookie sheet with parchment paper (use the same one from toasting the pecans and coconut). Scoop out about 3 tablespoons (85 grams) of dough and flatten the dough onto the sheet, forming a 3" disk. Continue with the remaining dough, spacing the cookies out by 1-inch. You will get 9-10 cookies. Bake the cookies until lightly browned, about 10-12 minutes. Allow to cool for 3 minutes on the baking sheet before moving to a wire rack to cool completely. oh man, these look just too perfectly gooey and delicious. Love the the addition of coconut – I wouldn’t have thought to add that! Ahhh yumm!! These look so good! Thank you so much for sharing and for all the kind words, girl! Mwah!!!! They look so fab. These were so, so good!!! My father ate this batch for lunch one day. The batch. He is 71. Why not!! You put the weighed measurement for all your ingredients! <3 <3 <3 Thanks for making life easy and minimizing my cleanup of measuring cups! I CANNOT WAIT to give these a try, your other chocolate chip cookie recipe was A+ and I'm sure this one will be amazing as well. Aww, thanks, you’re welcome, Lilly! aw your poor brother! 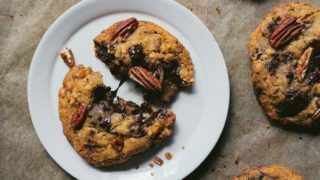 I love pecans, especially toasted, especially in delicious chocolate chunk cookies like these!! Another thank you for doing things by weight. When you bake gluten free, baking by weight is a must to get good, reliable results. I made these gluten free and I think I finally found a chocolate chip cookie I love!